Tom recently took a trip up to the part of the country where the Kuy people are living and was very encouraged by people along the way. Here are some of the stories. Simone is a young believer with a heart for evangelism. She moved to a Kuy village with her husband and family when she had been a Christian only two months. Though she herself is Khmer, she boldly shared immediately with Saren and his family. They believed and there is now a small house church in their village of Andas led by a Kuy believer from Phum Srae. As Tom and the group visited with Saren she took the opportunity to share her testimony with their taxi driver. Ask God to raise up many more like Simone and praise Him for Kee, who travels to Andas every Sunday to lead worship. Meng is a Khmer church leader in T’Beng Meanchey. He has a real heart for God and passion for evangelism to those who are least reached. Having learned of remote villages with no gospel witness, he takes the initiative to travel long hours on his motorbike to visit them. He even has to walk a good distance at times (once he had to park his motorbike and walk 18 km to reach the Kuy village of Thmea). He left a tape of simple Khmer Bible stories which Tom had previously given him. Yeay Tha, a Kuy widow, is one of the first Kuy believers that Tom met. They were able to visit her and found that she is standing firm in her faith, though she is the only Christian in her village and has no opportunity for regular worship with others. Pray that God will provide a discipler to teach her. Pastor Manasa and Matt (left) were here for three weeks in October. 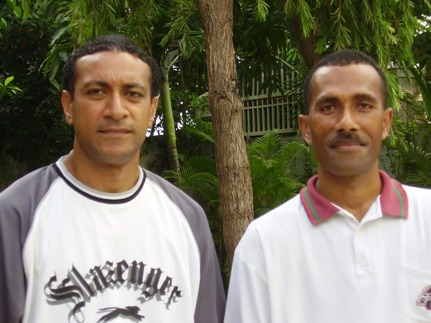 They are currently planting a church in Australia, but originally from Fiji. Matt and another man, Ben, have been commissioned by their church to be church planters among the Kuy of Cambodia. They went with Tom to “spy out the land.” Here are some of their comments. We are expecting Matt and Ben back before the start of 2006. Pastor Manasa, formerly a missionary to Papua New Guinea will be responsible for their home church support.